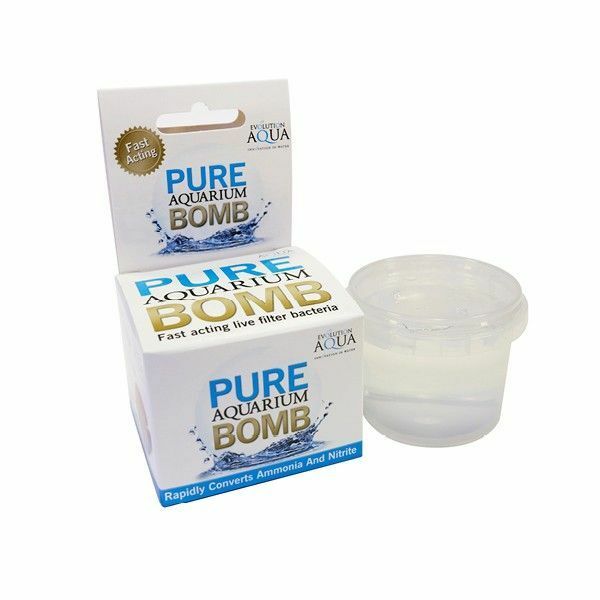 Joining PURE Aquarium, the unique, clear, live bacteria gel balls used in aquariums, PURE Aquarium Bomb is a much larger single treatment dose of live nitrifying bacteria designed specifically at cycling new aquariums and making them ready for fish. It also rapidly combats water quality emergencies in new and established freshwater aquariums, when life threatening levels of ammonia and nitrite are detected. Beneficial bacteria inside the filter can be lost through cleaning media under the tap, replacing mature media with new, or the use of medications. Increased fish numbers, uneaten food and dead, decaying fish can also lead to levels of ammonia and nitrite. Please note: PURE AQUARIUM BOMB is not intended to clear green water. An appropriate UVC is recommended to clear green water. Simply place PURE Aquarium Bomb directly into the main aquarium or better still into a space within a biological filter. One Bomb should be used per 200 litre aquarium, and will even work with a full stocking of fish. Use PURE AQUARIUM BOMB whenever water tests reveal levels of ammonia or nitrite in established aquariums containing fish. This may be due to beneficial bacteria inside the filter being lost through cleaning media under the tap, replacing mature media with new, or the use of medications. Increased fish numbers, uneaten food and dead, decaying fish can also lead to life threatening increases in ammonia and nitrite. - Use in conjunction with an airstone or strong aeration. - Always dechlorinate aquarium water before using this product. - The PURE AQUARIUM BOMB may break up in transit. If this happens, simply add all contents of the tub into your filter. - PURE AQUARIUM BOMB is not intended to clear green water. It is recommended that an appropriate UV-C should be used to eradicate green water. - PURE AQUARIUM BOMB is a natural product therefore it is perfectly normal that the ball may vary in size, colour and opacity. The colour of the liquid in the tub may also vary due to the nature of the product. None of this will affect the performance of the product. - PURE AQUARIUM BOMB can be used in conjunction with a UV-C.